Michael Benichou and his French pastry chef design cool and quirky cookies for luxury brand Moon Street. The cookies are available to buy through exclusive outlets in Paris, New York and at branches of Harvey Nichols in major cities in the UK. 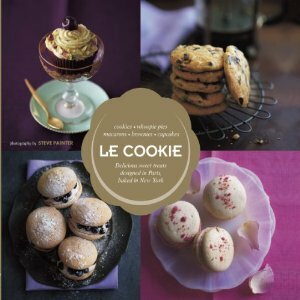 In this collection Michael share more than 25 recipes for cookies as well as deliciously different macarons, whoopee pies, brownies and cupcakes. There are five chapters in this little book each illustrated with a beautifully styled photograph of the cookie or cake. Cookies: The chapter starts with ‘Le Cookie’, the original and most traditional of the cookie recipes, these are definitely on my list of makes. It also includes Orange Crush Cookies, Praline Chic Cookies; Tres Yummy Cookies and Rebel Rose Cookies. Brownies: There are six recipes in this chapter starting with Bonjour Brownies, Sugar and Spice Brownies with cardamom and milk chocolate (mmmm! ), The Supreme which combines brownie with orange and zest and a sticky Bailey’s syrup, Coffee Lover’s Brownies (might make these for my husband’s next birthday), the Bijou Blondies contain extra virgin olive oil and white chocolate, and finally Crackling Brownie French Fries containing popping candy, cut into fingers and dipped in chocolate hazel nut spread. Whoopies: Very Berry Whoopies look a bit like a Devon split, a sandwich of whoopie pie fresh cream and summer berries, Made in France Whoopies are a salted caramel version, Fit for a Queen Whoopies are apparently inspired by a trip to London, Wicked Pecan Pie Whoopies with pecan nougatine, are you drooling? Fit for a King Whoopies are an Elvis special: Peanut butter and banana. The final Whoopie is a Jello Whipped Cream Whoopie a sort of Jelly and cream or bite sized trifle. Cupcakes: Good As Gold Cupcakes are a vanilla sponge with chocolate cream embellished with edible gold lustre dust, Mon Cherry Amour Cupcakes (see below), Pavlova Cupcakes don’t have any meringue in or on them, which I thought was a bit odd. Cupcakes du Jardin are an unusual combination of Lemon, Basil and strawberry which sounds very good. Dulche de Leche Cupcakes are sure to be popular. The final chapter gives us six Macaron recipes: Flower Power Macarons include crystallised rose petals, Raspberry cheesecake Macarons are pink and swirled with darker pink, filled with a sweet cheesecake filling; Mojito Macarons have a marbled effect and a white rum, lime and mint kick! Possibly the most unusual combination is the Carrot Top Macarons which contain carrot, cumin and orange, Tea Voyage Macarons made with green tea and jasmine look very sophisticated. The chapter and the book ends with the rich and decadent After Dinner Macarons a combination of rich chocolate and mint. This is a book of special occasion bakes, for showing off or treating a friend or loved one to a very special treat. All of the bakes look like those you would get at an expensive afternoon tea. If you are a fan of Moon Street cakes and would like to try and make your own, then this book is for you. 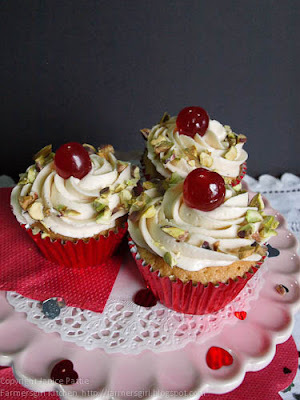 If you are fed up of the same old cupcakes and cookies, then you might enjoy trying the unusual flavour combinations. Great photographs mean that you know what you are aiming to achieve. Once you have mastered the basic technique for each bake, then you will find the variations are easy to achieve and might be inspired to make your own unusual combinations. I learned a new way of making cupcake batter, I've never had a recipe which you leave in the fridge overnight, but it works! There are only 27 recipes in this book. 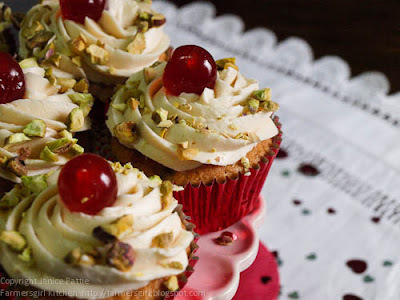 I really didn’t like the way that the basic recipe, in my case for the cupcake was only written out once and as it wasn’t included in the My Cherry Amour page, I had to keep flipping back and forward. I thought that was poor and expect each recipe to include all instructions on one page. As I said in the Cons, the flipping back and forth was a nuisance. There are some really nice recipes in this book, but if you already have a lot of baking books you probably have enough Cookie, Brownie, Whoopie, Cupcake and Macaron recipes to last you a lifetime. 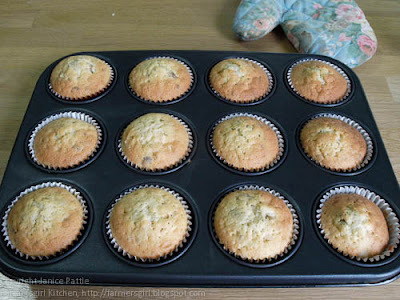 To make the Vanilla Cupcake Mixture, START THE DAY BEFORE you want to bake the cupcakes. Split the vanilla bean length ways and scrape the seeds out into a bowl. Add the eggs and sugar and beat with an electric whisk until tripled in volume and the beaters leave a thick ribbon trail when you lift them out of the mixture. Sift the flour and baking powder into the bowl and whisk lightly. Add the melted butter and fold in gently with a large metal spoon.Fold in the chopped pistachios. Cover and refrigerate for 24 hours. 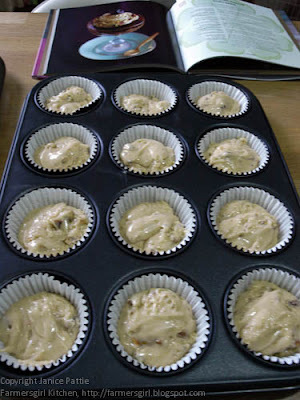 Divide the mixture between the cupcake cases and bake in the preheated oven for about 15-20 minutes. Remove from the oven and allow to cool completely. To make the pistachio buttercream put the butter sugar, milk, vanilla extract pistachio paste and Kirsch in a bowl and beat with an electric whisk or by hand with a wooden spoon until you get a light fluffy texture. Stir in drops of the food colouring until you get the desired shade of pistachio green, if you like. Fill the piping bag with the buttercream and pipe on top of the cold cupcakes. Balance a glace/candied cherry on top and sprinkle extra chopped pistachios around the edge. *To make your own pistachio paste, roast 125g/1 cup pistachios on a baking sheet in a a preheated oven at 160C (325F) Gas 3 for 10 minutes, taking care not to let them burn. Transfer to a bowl. Put 175ml/ 2/3 cup water and 60g/ 1/3 caster sugar in a saucepan and bring to the boil. When the sugar has dissolved and the liquid is boiling, cook over medium heat for 5 minutes. Carefully pour this syrup into a food processor with the roasted pistachios and 30g/ 1/3 cup ground almonds and pulse until you get a smooth paste. I didn't bother with the pistachio paste or the green food colouring and used Vanilla Icing Sugar from Sugar and Crumbs rather than add the vanilla separately to the buttercream, I didn't have any Kirsch so used cherry brandy. I was impressed with the cupcakes, the texture is firm and not over sweet. My work colleagues were even more impressed and the cupcakes disappeared very quickly. 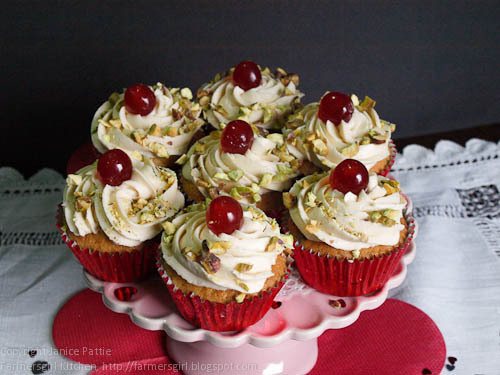 The cupcakes look very luxurious, taste delicious and would be perfect for a Valentine's Day treat. I was supplied with a copy of Le Cookie to review, I was not expected to give a positive review and all opinions expressed are my own. absolutely thorough and excellent review there Janice... nice work... and beautiful little cakes... i'm assuming these will arrive tomorrow with an anonymous card? Thanks Debs, they tasted pretty good too. Dom - what can I say...well, no actually, but only because you are supposed to be on a diet! Start the day before you want to make the cakes? That is never never going to happen in my kitchen. It would be a very easy thing to print the base recipes on a fold out page surely? Beautiful cakes, even if the do take 24 hours to make! Absolutely beautiful cupcakes you've got there! This coming from a person who doesn't normally like cupcakes. Fab review, Janice. I would so love to try your pretty cupcakes. The cakes look stunning. I may find it quite challenging starting the day before though. Another good review Janice. I am intrigued to know what tres yummy cookies are. I am now keen to make pistachio paste as it does sound rather scrumptious, but I think I shall have to save up a few pennies first. Your cakes look fabuloso. After 20 years of faithful service, my Sunbeam Mixmaster handed out. discovered that they just don't produce items just like they used to! the bowl get integrated into the batter, and it really is too big and heavy!